Whether you’re sponsoring, speaking, or just attending, events can be particularly time-consuming, as they can involve long-distance travel, advance preparation, lost productivity time, and the need to debrief (both for your own benefit and that of your colleagues or staff) afterwards. Conferences and events in general are a fantastic resource for the research phase of a content marketing plan. The obvious place to start is by talking to a lot of people — grabbing coffees or beers, and asking your fellow attendees what they care about, what they read, and what their challenges are at the moment, all of which can be turned into content ideas back in the office. Just make sure you have a pad and pen handy to take notes. Another smart way to gather research is to listen to the questions that are being asked at the end of talks and panel sessions. These are perfect subjects to then shape your content marketing plan, because you now know the types of information people are hungry for and what questions they need answers to. Last, but not least, hit the exhibition floor (if there is one) to learn what new products have been released, and see what trends you can find. People love reading about new technology that can improve their lives or jobs, and creating trend reports or sharing some market analysis with them is always valuable content. Events are also a rich source for content creation, with an abundance of opportunities to connect with industry thought leaders and decision makers that would otherwise be hard to reach. 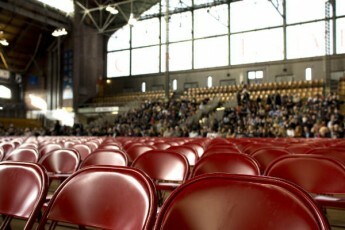 The obvious place to start for gathering content is by conducting interviews with speakers and high-profile delegates. Ideally, you should sync up with them on LinkedIn ahead of the event if possible. However, even if you can’t reach them ahead of time, a polite introduction and short explanation of what you hope to achieve, and where your content will appear, should help you bag the interview. If they’re speaking, it’s likely they have some interest in building a public profile after all. Speakers shouldn’t be your only focus though. If you have an exhibition stand at the show, try to record interviews with your customers, and even members of your staff, who might be flying in from other offices. This gives you a rare opportunity to let them contribute to telling your brand story. If your company is speaking at the event, then obviously you’ll want to record that session (or obtain a copy of it), but what if you’re not? Well, if you don’t mind being a little cheeky and creative, why not set up a talk in your booth? Unless it’s explicitly against the event’s terms and conditions, you could easily mic up a presenter, throw up a white screen canvas behind you to show your slides, and then record the talk. Last, but by no means least, if you’re able to attend enough of the sessions and engage in plenty of conversation around the event, you can turn your notes and observations into a post-event report. This can be invaluable for those who couldn’t make the event. Plus, because organizers are often strapped for time and budget themselves, they may not have produced an event report themselves, so you may be able to co-brand it with them and have it distributed to their whole database as a shared content piece. If you can’t cover the time and cost of producing a post-event report, you could at least consider live tweeting the event and compiling the texts into a post that tells a story about what was and wasn’t popular at the event. 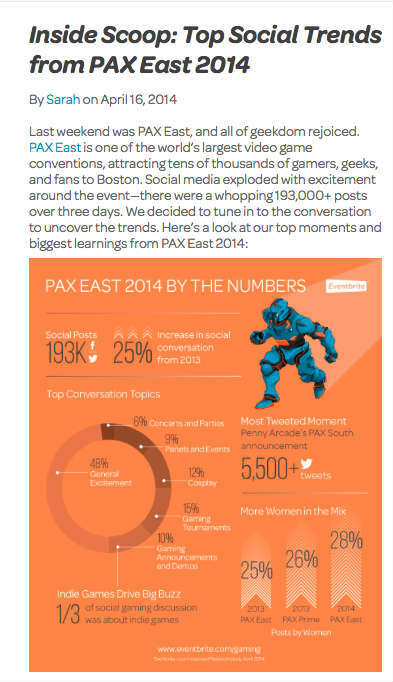 You could easily turn this into a blog post based on the key themes of the event (like the one we did at PAX East 2014, shown below). Given the need to create scalability and efficiency when it comes to content distribution, you might not think physical events would be the place to achieve those aims. However, they can be a great place to boost your distribution strategy. Connect with influencers: First and foremost on your agenda should be networking. Events are a fantastic place to shake hands and get to know the key media and influencers in your industry. Don’t waste this chance to build lasting relationships with just a cursory nod and exchange of business cards — actually take the time to sit down and get to know them (assuming you can persuade them it’s worth their time), find out their interests, and understand how you can add value to their professional life in the future. Just making a genuine connection with one major industry influencer could be the ticket to new heights in your distribution results. Leverage news and announcements: Take the opportunity to practice some on-topic “newsjacking” by following the trends and discussions taking place on social media during the event, and aligning your content with those in-vogue topics (being mindful that they’re actually relevant). Give away your content: If you have any involvement at the event beyond attending, it might be an opportunity to distribute your content on-site, such as offering it at your booth, or making it available at the conference press room or on message boards. Check to make sure all your marketing and promotional materials direct people to valuable content that positions you as a thought leader in your market. Of, if you happened to secure a speaking slot or place on a panel, make sure you mention a key piece of content, link to it in your slide decks, and recommend people drop by your stand to pick up a copy! These are all great opportunities to spread your content to the right people and build up plenty of buzz before expanding your activities online after the event. Measuring the success of your content marketing plan can be the toughest of the four core activities to do at a physical event, but that doesn’t mean there aren’t valuable lessons you can learn while there. If you’ve been giving away content at your stand, check which leaflets or white papers have been most popular (which you can measure either by looking at the depleted pile or tracking downloads via an event app if you’re using one). If you attended the conference the previous year, can you build up a count of how many people have heard of you (or your product) this year versus last year and, even better, what is it that brought you to their attention? This gives some solid on-the-ground feedback into how successful your awareness campaigns have been in the previous 12 months. You should also be able to use social media to gauge your success at the event versus at other times of the year. Have you gathered a lot more followers than normal? Were your posts shared or retweeted more often? Did you see a spike in requests to connect on LinkedIn or “likes” on your Facebook page? Chances are, if you got your content creation and distribution right while on-site, you should be seeing a spike in all those social metrics, and ideally a longer-term positive trend after the event. If you combine the ideas from above, you’ll see that events can be a gold mine of opportunity for the content marketer to use in their day-to-day jobs, rather than being a strain on your precious time. How do you view events fitting into your job? Do you love them or loathe them? And what is your advice for getting the most out of them? We’d love to hear from you in the comments below! Looking to enhance your content marketing plan based on the information you gather at live events? Don’t miss Content Marketing World 2014, September 8–11, 2014. Register today!